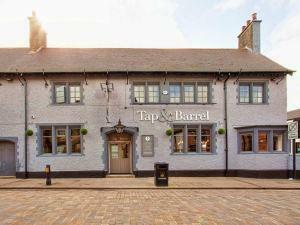 Tap & Barrel01977 326457work Public HouseWith a warm, welcoming atmosphere you'll feel right at home at the cosy Tap & Barrel. It's not just about drinking at the Tap & Barrel. Step behind the curtain and you'll find yourself in the very special Tap Theatre. This intimate space hosts live music, poetry, cinema, guest DJ's, guest speakers and special events throughout the year. Celebrating a special occassion or bringing your group? Taste the delights of fine foods available to order on request. Next time you're in the historic market town of Pontefract pop in and say hello to the friendly team at the Tap & Barrel. Located in the heart of Pontefract town centre.